Elegant, crystal-clear acrylic security pass holder that can be used in portrait or landscape format. With chrome-plated badge reel. 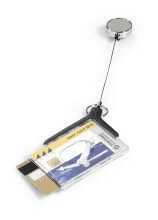 The badge reel has a metal clip on the reverse; safely holds one security pass / company ID card. Elegant, crystal-clear acrylic security pass holder that can be used in portrait or landscape format. With textile necklace; safely holds two security passes / company ID cards. Elegant, crystal-clear acrylic security pass holder that can be used in portrait or landscape format. With textile necklace; safely holds one security pass / company ID card. Elegant, crystal-clear acrylic security pass holder that can be used in portrait or landscape format. With chrome-plated badge reel. 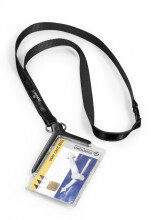 The badge reel has a metal clip on the reverse; safely holds two security passes / company ID cards. Length: 80 cm.